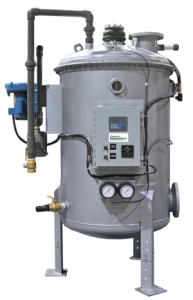 Paddock Regenerative Filter is an automated, stainless steel (best material for longevity) filtration system that operates at an incredible savings compared to industry standard filter systems. This regenerative filter uses either Perlite or Diatomaceous Earth (D.E. ), which provides the best available technology for optimal particulate removal to 1 Mircron. This Regenerative filter has been on market over 45 years, seeing most challenges with early development of product and is most reliable and best designed unit on market to date. To inquire about best regenerative media filter on the market, contact us at 800-849-2729. Widely recognized as the finest filter on the market, the Compak produces the clearest water while saving space, water and energy consumption, and labor for operators. Paddock has been manufacturing vacuum sand filters since 1978 and continues to improve their performance. The new Compak features an independent air scour distribution system separate from the underdrain header and laterals, allowing air scour to run concurrently with water backwash, reducing water usage. Directs water uniformly across entire media bed, preventing the possibility of channeling which provides a much more efficient use of media and longer filter runs. The redesigned media bed allows for a lower profile, creating more space above for surge capacity. An extra foot has also been added to the standard tank depth (now 8’) for the same reason. The backwash trough has been relocated from the end of the tank to the center for more efficient backwashing. 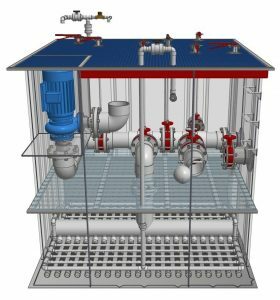 Type 316L stainless steel Chloramine Evacuator System is integral with all indoor Vacuum Sand Filters. Influent and effluent connections, along with return and backwash connections, are vertically oriented in the side of the tank for easier plumbing to and from the filter. V-grooves are integral to the tank on either side of the connections for structural strength. A single 3-way ultrasonic level switch draws the water level down for backwash, actuates a low water level shut-off, and has a relay for automatic water level control. The Compak Vacuum Sand Filter is a great space saver which eliminates filter room clutter. 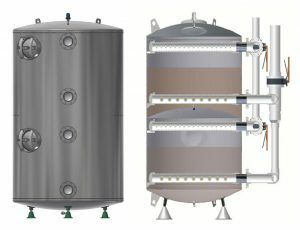 The tank walls are 316L stainless steel, and valves are nylon coated body and disc with 316L stainless steel components. The Compak is manually operated. This is a simple 10 minute manual backwash process which averages about 6 hours yearly. Paddock’s horizontal pressure filters are the most durable of their kind, and, with 99 models to choose from, provide the most options for economical commercial filtration in the industry. Tanks are available in diameters ranging from 36” to 96” and side shell lengths from 4’ to 12’. 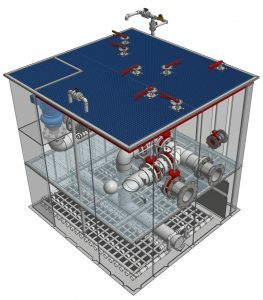 Dual-Cell Horizontal Filters are made exclusively by Paddock and are often used where backwash flow capacity is limited, in lieu of stacked tanks to save money and space. Made from Type 316L stainless steel, or carbon steel with various interior linings, these vertically oriented single, dual, or triple cell filters provide the most efficient pressure filtration with limited floor space. 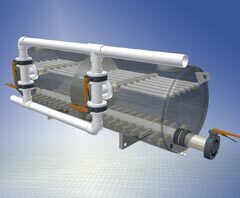 Paddock's HZF series filters offers high quality pressure sand filtration at a competitive price. 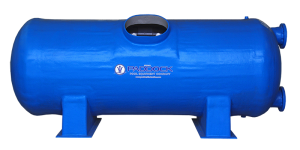 The corrosion resistant fiberglass tanks are designed to meet same performance specificatons of Paddock's stainless steel horizontal filters. Ranging from 16.5 sf area of our smallest vessel to 134 sf stacked, HZFseries can be used in virtually any commercial aquatic application.